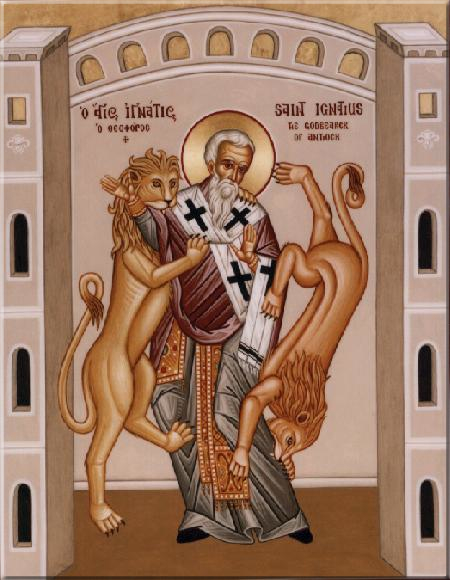 Oct 17 – St Ignatius of Antioch, (35-107 AD), Bishop, Martyr, Father of the Church | ADULT CATECHESIS & CHRISTIAN RELIGIOUS LITERACY IN THE ROMAN CATHOLIC TRADITION: hosting ONLY True Christians!! !, or "How to think Catholic!!" -painting of the martyrdom of St Ignatius of Antioch from the Menologion of Basil II (c. 1000 AD). In 637 AD, his relics were transferred to the Basilica di San Clemente in Rome. I can just imagine going down the line of the Confirmation class of eighth graders, every year or so, to the offspring of this family, and the next “victim” mumbling, as softly as possible, “polycarp”, and then the ensuing snorts and guffaws of their immature peers. Awesome! Growing up Catholic! You can see/hear the character building in the crimson face! Intentional, loving humiliation toughens us up for life! We’ll need it! We are unsure to this day whether my parents’ friends were cruel or had an unusual sense of humor? St Polycarp was a friend of St Ignatius of Antioch. Both are understood to have been disciples of The Apostle St John. The writings of Ignatius of Antioch attest to the sacramental and hierarchical nature of the Church. Born in Syria in the middle of the first century A.D., Ignatius is said to have been personally instructed – along with another future martyr, Saint Polycarp – by the Apostle Saint John. When Ignatius became the Bishop of Antioch around the year 70, he assumed leadership of a local church that was, according to tradition, first led by Saint Peter before his move to Rome. Ignatius led the Christians of Antioch during the reign of the Roman Emperor Domitian, the first of the emperors to proclaim his divinity by adopting the title “Lord and God.” Subjects who would not give worship to the emperor under this title could be punished with death. As the leader of a major Catholic diocese during this period, Ignatius showed courage and worked to inspire it in others. After Domitian’s murder in the year 96, his successor Nerva reigned only briefly, and was soon followed by the Emperor Trajan. Under his rule, Christians were once again liable to death for denying the pagan state religion and refusing to participate in its rites. It was during his reign that Ignatius was convicted for his Christian testimony and sent from Syria to Rome to be put to death. Escorted by a team of military guards, Ignatius nonetheless managed to compose seven letters: six to various local churches throughout the empire (including the Church of Rome), and one to his fellow bishop Polycarp who would give his own life for Christ several decades later. Ignatius’ letters passionately stressed the importance of Church unity, the dangers of heresy, and the surpassing importance of the Eucharist as the “medicine of immortality.” These writings contain the first surviving written description of the Church as “Catholic,” from the Greek word indicating both universality and fullness. 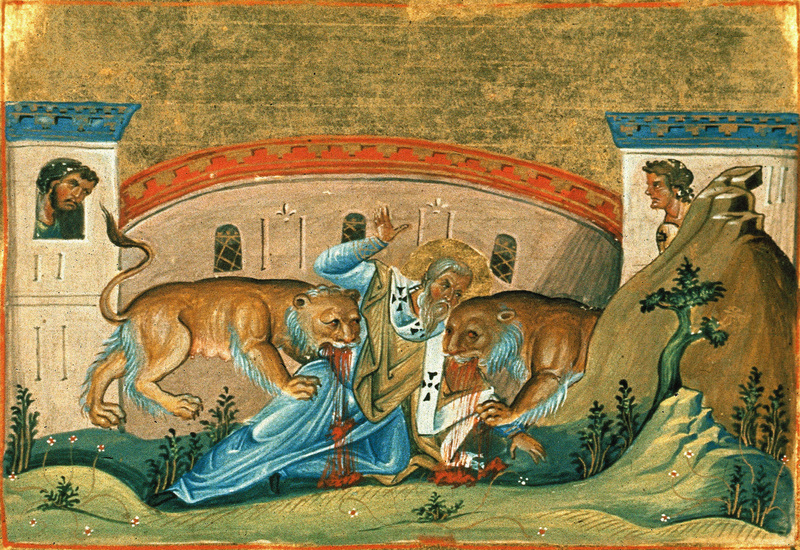 St. Ignatius of Antioch bore witness to Christ publicly for the last time in Rome’s Flavian Amphitheater, where he was mauled to death by lions. “I am the wheat of the Lord,” he had declared, before facing them. “I must be ground by the teeth of these beasts to be made the pure bread of Christ.” His memory was honored, and his bones venerated, soon after his death around the year 107. He stressed the value of the Eucharist, calling it a “medicine of immortality” (Ignatius to the Ephesians 20:2). The very strong desire for bloody martyrdom in the arena, which Ignatius expresses rather graphically in places, may seem quite odd to the modern reader. An examination of his theology of soteriology shows that he regarded salvation as one being free from the powerful fear of death and thus to bravely face martyrdom. “Be not seduced by strange doctrines nor by antiquated fables, which are profitless. For if even unto this day we live after the manner of Judaism, we avow that we have not received grace … If then those who had walked in ancient practices attained unto newness of hope, no longer observing Sabbaths but fashioning their lives after the Lord’s day, on which our life also arose through Him and through His death which some men deny … how shall we be able to live apart from Him? … It is monstrous to talk of Jesus Christ and to practise Judaism. For Christianity did not believe in Judaism, but Judaism in Christianity.” — Ignatius to the Magnesians 8:1, 9:1-2, 10:3, Lightfoot translation. “Wherever the bishop appears, there let the people be; as wherever Jesus Christ is, there is the Catholic Church. It is not lawful to baptize or give communion without the consent of the bishop. On the other hand, whatever has his approval is pleasing to God. Thus, whatever is done will be safe and valid.” — Letter to the Smyrnaeans 8, J.R. Willis translation.